COOKE CITY — The fourth grizzly bear believed involved in a triple mauling at a Montana campground has been captured, with DNA tests due Friday that could confirm the family of grizzlies killed a Michigan man and injured two other people. A sow and two of her three cubs had been trapped by Thursday, with a year-old cub found in a trap early Friday. 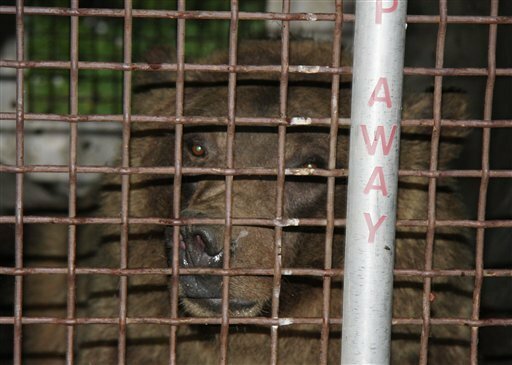 The bears — crying and scratching at the steel sides of traps — were taken from the Soda Butte campground in a three-truck convoy. 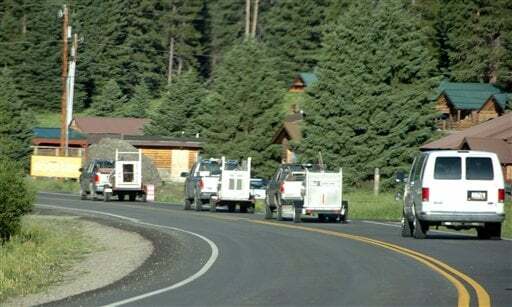 Their departure brought relief among residents and visitors in Cooke City, an old mining town just outside Yellowstone National Park that was jolted by the Wednesday attacks on three people as they slept in separate tents. "They captured them? All of them?" asked Linda Olson. The 60-year-old nurse from Minnesota let out a sigh when she learned the answer was yes. The cubs will likely go to a zoo, said Chris Servheen, a U.S. Fish and Wildlife Service grizzly bear recovery coordinator. The sow will have to be killed so officials cand conduct an autopsy to determine if any physical ailments or conditions caused her to attack the campers. Officials said they won't decide the fate of the bears until they see the results of DNA tests. Authorities said the bear family, under the tutelage of the mother, specifically targeted campers — a sharp departure from the usual behavior of grizzlies attacking only when threatened or surprised. Evidence indicated all three cubs likely participated in what Warden Capt. Sam Sheppard called a sustained attack on Kevin Kammer of Grand Rapids, Mich. He was pulled from his tent and dragged 25 feet. At least one of the bears fed on his body. Despite the unusual nature of the attacks, there also was a realization in Cooke City that bear run-ins would continue. Three million tourists a year visit the remote and wild Yellowstone region of Montana and Wyoming, which has an estimated 600 grizzlies. "It's a great spot, but you have to realize we're in their home. We're part of the food chain," Pat Froelich, 75, said as she watched the trucks haul the grizzlies from town as she ate breakfast at the Bear Claw Bakery. Fibers from a tent or sleeping bag were in the droppings of the captured bears, and a tooth fragment found in a tent appears to match a chipped tooth on the sow that weighs more than 300 pounds. "Everything points to it being the offending bear," said Ron Aasheim, a spokesman for Fish, Wildlife and Parks. The two other victims, Deb Freele of London, Ontario, and Ronald Singer of Alamosa, Colo., were initially hospitalized in Cody, Wyo. Singer, 21, was treated and released. Freele was scheduled to have surgery Friday for bite wounds and a broken bone in her arm, her husband Bill Freele said. He expected her to be released from the hospital sometime this weekend. Freele said his wife had wanted to carry on with their trip but reconsidered after having nightmares about the attack. "Right now, she just wants to see the kids," he said. Deb Freele is a native of Michigan and knew Kammer but did not realize he was in the same campground or that he was the victim until she saw his picture with a story about the maulings, her husband said. Bill Freele was in Cooke City on Friday retrieving the couple's camping equipment. He believes the mother bear should be killed "because it tasted humans." He was fine with placing the cubs in a zoo. "Just don't tell me where it is," he added. Messages left Thursday for Kammer's mother-in-law and brother-in-law in Michigan were not returned. Singer and his mother Luron Singer did not immediately return e-mail messages from The Associated Press seeking comment. Luron Singer told The Denver Post that her son, a former high school wrestler, had been camping with his girlfriend. He started punching the bear when he felt it biting his leg, she said. His girlfriend screamed, and the bear ran away. "He is doing fine," Luron Singer told the newspaper. "He went fishing today." Freele said she couldn't understand why the bear attacked her, because she posed no threat. "If it was something that I had done — if I had walked into a female with cubs, and startled her, and she attacked me — I can understand that," she said. "She was hunting us, with the intention of killing us and eating us." All the victims did the right thing, and there was no telling why the bear picked out those three tents, Sheppard said. Operator: 'You can just hang out there. We're gonna page out an ambulance to come and check him out. And then we're gonna get rangers on the scene to take out this bear. If anything else worse happens give me a call right back, ok?